Last week I reviewed Desert Blush and Wild Fire, two fragrances from the new-ish brand Raw Spirit, both inspired by the landscape of the Australian outback. This week I tried Winter Oak and Summer Rain; once again, these fragrances were developed for Raw Spirit by perfumer Harry Fremont, but they refer to seasons in California and Florida, respectively. Winter Oak is "a smooth, creamy, warming scent" inspired by "the oak-lined trails of the Chumash Lands of California on cool winter mornings." Its composition includes clary sage, bergamot, pepper, lemon and geranium; saffron, maté, clove bud and olibanum; leather suede, oakwood, oakmoss, cedarwood, vetiver, patchouli and musk. It feels more nuanced than the woody Wild Fire, and it plays an interesting game on me: it has cool-air notes that seem to hover just above the surface of my skin, while the warmer notes of spice and tea and moss cling more closely. I'm not usually a fan of saffron, but it works nicely as an accent here. Joyce Lanigan, a cofounder of Raw Spirit, is quoted on Raw Spirit's Facebook page: "Winter Oak still has the rawness of the natural ingredients, but is elegant and complex too. . . .The top note is like a brisk walk in the woods, but then quickly mellows to a smooth warmth that makes me want to curl up by the fire. Winter Oak makes me look forward to winter!" That's pretty much spot-on. I don't usually look forward to winter, but the unseasonably warm temperatures are making me nervous, and Winter Oak soothes me a bit. I'd recommend it to fans of Sonoma Scent Studio Forest Walk or the Frapin line. Summer Rain takes "summer in the Florida Everglades" as its point of departure, and it's "a fresh and invigorating citrus fragrance" with neroli, bergamot, lime, leaves, basil, mandarin and grapefruit; orange flower, mint, galbanum and jasmine; vetiver, moss, cedarwood, labdanum and ambrox. 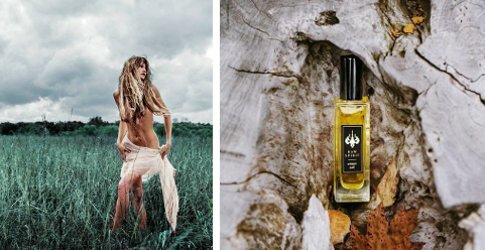 I suppose every new niche fragrance line has to include a citrus fragrance, and Summer Rain is Raw Spirit's entry in that category. It's a sophisticated-hippie take on Eau de Cologne, with a greenish shimmer from the lime and galbanum and some very clean white flower-petals floating over sheer woods. (Cedar has made an appearance in all four Raw Spirit fragrances I've tried thus far — it is a signature note from the brand?) The base smells more synthetic than the rest of the fragrance and tickles my nose a bit. If you're a fan of citrus colognes, you may want to try Summer Rain; it fits the same general category as Eau d'Italie Acqua Decima and Jul et Mad Aqua Sextius. I don't find it particularly original, but it's put together well and it would no doubt feel very refreshing on a hot day. Like Winter Oak, it's very gender-neutral and it has a geographical/meteorological origin story: it's "inspired by summer in the Florida Everglades, when the air is thick with humidity and the afternoon storm clouds build." Overall, Raw Spirit delivers on its promises, and it does so with a manageable number of fragrances (six, currently) and a consistent "feel." We certainly can't say that about every new niche fragrance line, right? I'll be curious to see what Raw Spirit does in 2016. Raw Spirit Winter Oak and Summer Rain are both available as 7.5 ml ($40) or 30 ml ($90) Eau de Parfum, or as part of the Discovery Set (six 1 ml samples, $20). To purchase or to view a list of additional vendors, visit the Raw Spirit website. As noted there, a portion of the proceeds from the sale of these fragrances supports Native American cultural preservation projects. I’ve been interested in Winter Oak, nice to see a review for it! It’s being promoted on Beautyhabit and other sites as a winter scent — I liked it more than I expected to! You never know. Hi Jessica. I probably won’t go out of my way to hunt these down, but I’ll look for local stockists (their website is making me roll my eyes though). I’m a little intrigued by Winter Oak since I actually live in the “Chumash Lands of California,” but boy, these are pricey too. Anyway, thanks for the review as I hadn’t heard of this line at all. Do you lounge around outdoors with fashionably “ropy” hair? We need to know! lol. Niche/indie hasn’t gotten any cheaper lately, alas. Website made me roll my eyes as well. Their next fragrance definitely needs a note of irony. However, simply speaking the word Chumash is an act of preservation as Californians and the rest the country find it hard to remember any of the first people here. So even if it winds up being the name of an Australian perfume firm’s new fragrance, it is pleasing to hear, and I will definitely put it on my to-sample list! Not name, inspiration… But you know where I was going…. The t-shirt weather in December is making me unnerved, too. I mean, I’m not really complaining, but it makes me worried that we won’t have much “Raw Spirit” left on our planet in a few years. Toronto shouldn’t be Palm Springs. Lovely reviews, by the way! It’s a justifiable worry! I’ve really been rattled by the sight of bare-legged women and coatless men this close to Christmas. Just weird. Thanks for reviewing this line, which I had not heard of either. A $20-discovery set is always a plus. The unseasonably warm temperatures are making me nervous, too, but thankfully not nearly as nervous as I would feel if I were lost in the Everglades wearing nothing but a shawl, glancing over my shoulder and wondering if that crunching sound I heard in the tall grass was an alligator. Hooray for discovery sets! — and yes, poor Behati Prinsloo, stuck out there in a Floridian Eden in such a state of undress! Funny how that happens when there is a photographer around!